First and foremost it was a great cruise. Any criticism I have here should be taken lightly as I consider it very minor. We chose this cruise for the itinerary, Princess was the only cruise line that had the dates we wanted and ports we had never been to. We are four time Carnival cruisers and had heard good things about Princess so why not. The staff was wonderful, as they have been on every cruise we have been on. The food was really good, on par with Carnival. Naturally we liked some dishes better than others (depends on your taste) but all really good quality and quantity. Good selection in the dining rooms and great selection in the Horizon buffet. I highly recommend the Bayou Cafe, my wife and I thought it was the best steak filet we have ever had. Service there was great as well. Just a warning about anytime dining, they allow reservations which defeats the purpose in my opinion because it now ties a table to a time. If you don’t get there by 5:30 or after 8 you are going to wait (they’ll give you a pager). We never had to wait a long time but it’s annoying watching people get there after you go in before you. There was lineups to get in the Horizon Court but that was due to a continuing Norovirus outbreak so you had to wash your hands before going in (and shame on the people that sneak around the line and claim they just washed their hands). Also due to this they had to serve everything to you in the buffet which slowed things down a bit but I was grateful because we didn’t catch anything. Don’t base your decision to go on this because it was not a normal situation (it had been eradicated by the end of the cruise). As another reviewer said, there was definitely an older crowd on this ship. We are also early 60’s and felt like we were part of the youngest group aboard, I suspect a lot of the negative reviews are due to the older demographic. Yes the ship is smaller than the newer ones but it has to go through the Panama Canal. It never felt overcrowded though, there are the usual people that stake out loungers first thing in the morning and then come back 2 hours later but we always managed to get a spot we liked. Getting a table in the Horizon Buffet at peak times was a challenge but that’s to be expected if everyone goes at the same time. Entertainment was good in the theatre, again catering to an older crowd. Most of it not my thing but it was very well done. Get there early though, it’s full 15 minutes before showtime. We thought there could have been more deck entertainment but again, older crowd, so they could be keeping it sparse for them and there was always something on the movie screen (we saw 4 good movies while sunbathing). To be fair, on the first sea day they tried to get people to join the Hairy Legs competition and not one person volunteered. Different story on the last sea day, they got 8 contestants, and later an impromptu beach ball game broke out in the pool. There is also another pool with a retractable roof that they don’t open, we went in there once to get out of the blazing sun and it was ok but it’s an indoor pool so I’ll leave it at that. Ports and excursions were great. You have to bear in mind that most of the stops are industrial ports so if you don’t do an excursion you’re not going to see much. Grand Turk was excellent, no excursion required. We lucked out as we were the only ship that day so it wasn’t crowded. Tropical paradise with Jimmy Buffet drinks! (By the way you can research how many ships will be in a particular port each day on line, just google “ship port calendar”) We took the bus/walking tour in Cartegena which was really good. The street vendors really pester you but you just have to be patient and keep saying no thank you (they would usually leave and then come back 2 minutes later, but hey, they’re just trying to eke out a living). Some of them were quite comical and give you a laugh during their efforts. The city is beautiful and full of history. The Panama Canal is amazing! We got to the front observation deck at 6 am and stood mesmerized for the next 3 and a half hours. We felt we didn’t need to do an excursion there as the canal transit was the attraction for us. We stopped in Colon after we came out and there wasn’t much there but it didn’t matter as the transit itself was our day’s excursion. After seeing not much in Colon we booked the Bus/boat/rainforest walk excursion in Limon. Amazing. Think Disney Jungle Cruise but for real. Saw a Toucan, Sloths, Jesus Christ Lizards, Iguanas, Howler Monkeys, Poison Dart frogs and the Coast Guard station with a confiscated drug runner boat. We did Dunn’s River falls and the Bamboo Beach VIP excursion in Ocho Rios. Again excellent. If your knees and heart can handle some exersize, go for it, it was a lot of fun. The Beach club was not what I expected, it’s a little rustic, but we walked out of there a little wobbly from the free drinks and so full we couldn’t go to the dining room that night. Two observations: we thought the rum drinks tasted like plastic from the coolers at first until I realized it was Appleton’s rum we were tasting; and the difference between the VIP and the regular excursion is that they serve you food and drinks instead of having to get them yourself. All three excursions we took had excellent guides and were well worth it. I also want to mention that the embarkation/debarkation/transfer were the smoothest we have ever experienced. So all that said, I would highly recommend this cruise and I hope this helps your decision. First and foremost it was a great cruise. Any criticism I have here should be taken lightly as I consider it very minor. We chose this cruise for the itinerary, Princess was the only cruise line that had the dates we wanted and ports we had never been to. We are four time Carnival cruisers and had heard good things about Princess so why not. 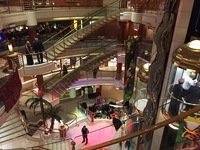 The staff was wonderful, as they have been on every cruise we have been on. The food was really good, on par with Carnival. Naturally we liked some dishes better than others (depends on your taste) but all really good quality and quantity. Good selection in the dining rooms and great selection in the Horizon buffet. I highly recommend the Bayou Cafe, my wife and I thought it was the best steak filet we have ever had. Service there was great as well. Just a warning about anytime dining, they allow reservations which defeats the purpose in my opinion because it now ties a table to a time. If you don’t get there by 5:30 or after 8 you are going to wait (they’ll give you a pager). We never had to wait a long time but it’s annoying watching people get there after you go in before you. There was lineups to get in the Horizon Court but that was due to a continuing Norovirus outbreak so you had to wash your hands before going in (and shame on the people that sneak around the line and claim they just washed their hands). Also due to this they had to serve everything to you in the buffet which slowed things down a bit but I was grateful because we didn’t catch anything. Don’t base your decision to go on this because it was not a normal situation (it had been eradicated by the end of the cruise). As another reviewer said, there was definitely an older crowd on this ship. We are also early 60’s and felt like we were part of the youngest group aboard, I suspect a lot of the negative reviews are due to the older demographic. Yes the ship is smaller than the newer ones but it has to go through the Panama Canal. It never felt overcrowded though, there are the usual people that stake out loungers first thing in the morning and then come back 2 hours later but we always managed to get a spot we liked. Getting a table in the Horizon Buffet at peak times was a challenge but that’s to be expected if everyone goes at the same time. Entertainment was good in the theatre, again catering to an older crowd. Most of it not my thing but it was very well done. Get there early though, it’s full 15 minutes before showtime. We thought there could have been more deck entertainment but again, older crowd, so they could be keeping it sparse for them and there was always something on the movie screen (we saw 4 good movies while sunbathing). To be fair, on the first sea day they tried to get people to join the Hairy Legs competition and not one person volunteered. Different story on the last sea day, they got 8 contestants, and later an impromptu beach ball game broke out in the pool. There is also another pool with a retractable roof that they don’t open, we went in there once to get out of the blazing sun and it was ok but it’s an indoor pool so I’ll leave it at that. Ports and excursions were great. You have to bear in mind that most of the stops are industrial ports so if you don’t do an excursion you’re not going to see much. We took the bus/walking tour in Cartegena which was really good. The street vendors really pester you but you just have to be patient and keep saying no thank you (they would usually leave and then come back 2 minutes later, but hey, they’re just trying to eke out a living). Some of them were quite comical and give you a laugh during their efforts. The city is beautiful and full of history. The Panama Canal is amazing! We got to the front observation deck at 6 am and stood mesmerized for the next 3 and a half hours. We felt we didn’t need to do an excursion there as the canal transit was the attraction for us. We stopped in Colon after we came out and there wasn’t much there but it didn’t matter as the transit itself was our day’s excursion. After seeing not much in Colon we booked the Bus/boat/rainforest walk excursion in Limon. Amazing. Think Disney Jungle Cruise but for real. Saw a Toucan, Sloths, Jesus Christ Lizards, Iguanas, Howler Monkeys, Poison Dart frogs and the Coast Guard station with a confiscated drug runner boat. We did Dunn’s River falls and the Bamboo Beach VIP excursion in Ocho Rios. Again excellent. If your knees and heart can handle some exersize, go for it, it was a lot of fun. The Beach club was not what I expected, it’s a little rustic, but we walked out of there a little wobbly from the free drinks and so full we couldn’t go to the dining room that night. Two observations: we thought the rum drinks tasted like plastic from the coolers at first until I realized it was Appleton’s rum we were tasting; and the difference between the VIP and the regular excursion is that they serve you food and drinks instead of having to get them yourself. All three excursions we took had excellent guides and were well worth it. I also want to mention that the embarkation/debarkation/transfer were the smoothest we have ever experienced. So all that said, I would highly recommend this cruise and I hope this helps your decision. This was the first time we have booked an inside cabin as it was 2k cheaper (that’s a lot of drinks and excursions). Cabin service was excellent. The cabin was a little smaller than we were used to but I would chalk it up to the ship being built for the Panama Canal. The bed was really comfortable and there was ample storage space.Yes, the shower is really small but not a problem if you are normal size. There was really no noise or vibration to speak of other than it was a pretty rocky cruise so sometimes a drawer, door or some hangers would make some noise. Motion doesn’t bother us though, so no problem. I would do an inside cabin again depending on the itinerary. Although a balcony is always nice, we knew we were going to be at the front of the ship through the canal (see other reviews) and it also forced us to get out and up on deck to enjoy the fresh air and sunshine.